We all have daily problems with technology, but how many of us can fix them? Mya Le Thai is a scientist studying at the University of California, Irvine. She recently discovered a process that may result in batteries that last forever. VOA Learning English spoke with Thai about her discovery. Thai said she had been frustrated that the batteries for her wireless devices degrade. Over time, they fail to charge fully. Thai did not like to have keep her wireless laptop connected to an electrical outlet. She decided to do something about that problem. At first, she and her team at UC Irvine thought about inventing a new battery. But as they experimented, Thai discovered something that might permit lithium-ion batteries to last forever. Lithium-ion batteries power most wireless devices. Over time, the batteries lose the ability to hold a charge. Most of these batteries have a life span of about 7,000 charging cycles before they die. One of the reasons lithium-ion batteries degrade is their use of nanowires to carry electricity. 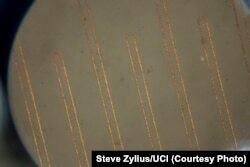 Nanowires are extremely thin. A human hair is thousands of times thicker, for example. Nanowires are extremely efficient carriers of electricity, which makes them useful in batteries. But Thai said their thinness also makes them weak. "Nanowires break and fracture over time," she said. "That's why they lose capacity." But, Thai had a theory: The nanowires might last longer if covered with a gel. She and the team tested her theory. "It was a long process and a lot of work," Thai said. The team tried many coverings for the wires. PMMA was one of them. 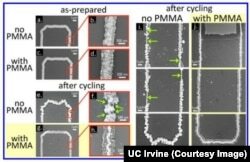 The nanowires were coated with PMMA and cycled through charges 200,000 times. The PMMA coated nanowires showed no evidence of damage. The results suggest that batteries could last forever, without losing charging ability. Thai said 200,000 cycles amount to about three months on just one device. Thai hopes to continue her research to understand why this gel works so well and to see if any other gel could create better results. Mya Le Thai told VOA she is enjoying the publicity about her discovery. She said she never expected her research to get media coverage. "It's kind of cool," she said. "I'm really glad people are showing interest in my work and not just in the work itself, but also in technology and energy." Carolyn Mohr wrote this report for VOA Learning English. Caty Weaver was the editor. Do you look forward to a day when batteries last forever? Share your thoughts in the Comments Section below or on our Facebook page.